China getting into deep water? Over 450mm of rain fell from June 13 to 19, 2011 – that is more in 6 days than many parts of SE England get in a year! No wonder life is a bit damp in China this week. Poorly resourced Pakistani authorities are struggling to help flood victims, many of whom have lost everything and say they received no warnings that raging waters were heading their way. United Nations World Food Program spokesman Amjad Jamaal said an estimated 1.8 million are in dire need of water, food and shelter. Bistma Bibi, 65, who lost two grandsons in the floods, accused state relief workers of only helping friends or relatives. “I came here at 5 o’clock in the morning. I begged and fought but got nothing. They’re giving them (supplies) to their people,” she said. President Zardari, meanwhile, is in Europe on a state visit, which has angered both ordinary Pakistanis and political parties who wonder why he is abroad during a difficult period. But during a meeting with French President Nicolas Sarkozy in Paris Zardari asked for immediate international aid. The U.S. embassy has announced $10 million in immediate humanitarian aid, with more to be earmarked as necessary. The European Union will donate 30 million euros ($39.5 million) while China will donate 10 million yuan ($1.5 million). To add to the people’s misery inflicted by the floods, food prices are also rising sharply as agriculture has been wiped out. Authorities forecast more of the heavy monsoon rains that have been lashing the area for the past week. This was true. However the lack of sensitivity in this test does not make it particularly useful in testing for example for organic decay causing a reduction in oxygen. A more sensitive test might have shown differences between sites 1, 3 and 4. The only real evidence of organic pollutants was the sheep hoof marks at the ford and this did have the most acidic results. The anomaly here though was the alkaline (pH8) at the waterfall. Having sort the advice of a chemistry expert, we decided that there are 2 possibilities for this. (b) High levels of dissolved CO2 can cause a lowering of pH as some of the CO2 becomes dissolved in the water to form a weak acid, carbonic acid. So lack of CO2 may mean that the water has a higher pH than expected. At the waterfall, the water was shallow and the rock was smooth and there was no evidence of either plant or animal life, so it is possible that low CO2 could account for the high pH. (a) Experimental error. See below for more detail on this in the evaluation. (b) The theory is that the slope of the river bed is steeper the nearer the source you are. It is the slope that determines the velocity of the river. So on average, the course of the river tend to be steeper the nearer you are to the source. (c) The other factor that needs to be taken into account is the bedload. Large angular rocks and hard resistance channel sides and base force the water to go around the obstructions. These create friction with the water, both of which slow the water down. This was demonstrated clearly by the path of the orange that was rejected in site 4! Hypothesis 7: The estimated discharge will increase the further the site is from the source. Both these hypothesises were shown to be just about true from the data. Although (see in the evaluation) how valid the figures were leaves is open to question. The data also showed that the width and depth can vary quite a lot, both reducing and increasing over the distance examined, but it their combination that shows some consistent increase, the further downstream the site is. The kit was complete and simple to use. The instructions were clear so as to make the best possible use of the test available. However, the lack of sensitivity of the dissolved oxygen test means that tests over one water course is unlikely to show any great variation as there is only one ‘moderate’ value (4ppm). What else I could have done: I could have tested more sites, although given the similarity of the river chosen, I am not sure if this would tell me anything. However, what I can and will do, is to retest those same sites when the environmental conditions change. For example, we had had little rain in the preceding 4 weeks and the weather was unusually mild for the time of year. So I will retest after heavy rain when it is colder and also in high summer, when the water is even lower. These tests could have been carried out with more care as I do not feel that I got accurate enough results to be sure of the conclusions. The measurement of maximum depth in one place only and its use to estimate the cross-section was not good enough. All in all I enjoyed the experience and have learnt lots about how to do it better next time. Definitely a bit of a struggle to find different ways to graph the data. Not really happy with the result, but I cannot do any better! The lowest pH was at the ford (site 3) which was adjacent to the field with sheep in. There was evidence that the sheep used the stream to drink from. There was no other source of water in that field and there were hoof prints on one side of the ford. The cause of higher pH at the waterfall (site 2) is not known and a bit of a mystery. The temperature of each site was similar, just a little lower than the air temperature in each case. This is as would be expected, as the mild day time tmeprature increase the air temperature faster than the water temperature. The dissolved oxygen levels are very approximate by this test, but certainly gave the expected results, with the water that has just fallen of the falls having the highest oxygen content. For the velocity graph, the values were re-arranged in each case, into minimum and median and maximum values. By doing this it was easier to show that not all the surface water, which the floating orange shows, is the same at any one site. In fact in one case on on site 4, the orange took 299.97 sec to cover 10 metres, as it got into a back loop and returned up stream twice before it managed to pass the 10 metres mark. This sample was discounted, at it would have had an unduly large impact on the average velocity and hence the discharge. However, had say 10 measurements of that river been included, then including that one would havegiven a fairer outcome. Tomorrow the evaluation and conclusion – it will be fairly damning as I could have done a lot better! My next job is to find a good way to present these graphically – it will not look as neat on a blog as it would in a word doc. but I will see what I can do! What was needed: Thermometers strips, 0.5 m of down pipe as explained below, watch with second hand. The 2 thermometers (one low and one high temperature) were both on sticky backed strips. These were stuck to the bottom edge of a piece of down pipe. The thermometers needed to be kept 10 cm below the surface of the water for 1 minute. So a tape was fixed 10cm from the end of the pipe with the thermometers on, that gave the level and keep the hands dry (and warm). The down pipe was lowered into the water until it reached the level of the tape and timed for I minute. The temperature was recorded. The thermometer strips showed temperatures rising in gaps of 2. If 3 strips were highlighted, the middle one was recorded. If 2 adjacent number bars were highlighted equally, the average of the pair was recorded. What was needed: chemical test tablet, the small tube from the kit, a watch with a second hand, the conversion chart for ppm (parts per million) against temperature. The small bottle was filled up to the top with water. 2 tablets were added. The bottle was left for 5 minutes. The colour was tested against the colour chart and recorded. Using the conversion chart, the ppm was also recorded. What was needed: chemical test tablets, a tube with lid provided in the kit, colour chart. A sample of water enough to fill tube to the 10ml marker was collected from the river. 1 testing tablet was added and the top was placed on the bottle. It was shaken until the tablet had dissolved and then the colour was checked against the colour chart and the pH was recorded. What was needed: turbidity disc, container from the kit, comparison chart. The disc was fixed to the bottom of the container. The water was taken from the river to fill the container and the visibility of the disc was assessed by comparison with the chart. The result was recorded. What was needed: a supply of aging oranges free from the veg shop, a 30m tape, a stop watch, a fishing net to catch the oranges. A 10 metre distance was measured along the river bank. The start and the finish was marked. 3 oranges were dropped in the river in different spots across it. This was because it was obvious that the water passing through in different parts of the river varied in velocity and so to get a full range gave a better estimate of the average surface velocity. The time taken to go from start to finish was recorded. The oranges were hopefully caught after they had passed the finish. Using velocity = distance/ time, the velocity was estimated and recorded. Then the average surface velocity could be found by adding the 3 results and dividing by 3. I could not really say what I expected until I got there. But here is the general theory about each variable and what I expected. Tomorrow, I will tell what we actually found! Water is slower to warm and slower to cool than the land. The air temperature above the land is affected by the land temperature below it. So given this was a pleasant mild day, I would anticipate that the water temperature would be a bit lower than the air temperature. There is no other sources of warmth along Nant Gwynllyn so I would not expect any peaks or troughs anywhere along the river. So all sites would probably be the about the same as each other and would be a few degrees below the air temperature. The lower the temperature the more oxygen can dissolve in the water before it becomes saturated. Certain water bodies, like swamps, naturally have low levels of dissolved in the water. This is because decaying matter uses a lot of oxygen during decomposition – or more accurately the micro-organisms that break down the decaying matter use up much of the oxygen in the process. Many rivers do not have a single source, but ooze out of boggy areas, which can lead lower dissolved oxygen levels. Much of the oxygen in water comes from plants during photosynthesis so the presence of plants would indicate higher oxygen levels. The amount plants add vary with the time of day. During the day they are adding to the DO but once the sun goes down, photosynthesis stops and respiration takes over as the main plant process, so they like the animals use up the dissolved oxygen. Oxygen from air as wind blows across the water’s surface and can add to the overall level as can the presence of ‘white water’ as the air bubbles mix with water as it tumbles over the rapids and waterfalls. There was little wind that day, so no site would have oxygen entering from the air by this method. Site 1 was just below the place where the river came off a plateau which contained a bog from which much of the water was sources. There was little plant life there. So the dissolved oxygen would probably be lower. Site 2 had lots of white water from so probably this site more than any other will have a higher dissolved oxygen. Site 3 & 4 were both under the trees, so did not get much sunlight, but there were few water plants in either. Neither had white water although in both the water had currents in and shallow slow flowing parts, so their dissolved oxygen would likely be lower than site 2. The expected values are 6.5–8.5, from slightly acid to neutral to slightly alkaline. There is some potential sources of acid in this river, from the acid given off by peat or other rotting material around the sources and also from animal pollution. But given this is on a site to the west of the UK, as most of the rain bearing clouds come across the Atlantic and so do not have acid in the clouds from industrial processes. Site 1 is near the boggy sources, so this is likely to be more acid. By the time the water reaches Site 2, the water may be slightly less acid. Turbidity refers to how cloudy the water is due to the solids carried in it in suspension. High turbidity indicates a lot of suspended material while low turbidity means that it can be seen through quite clearly. The turbidity determines how much light gets into the water and how deep it goes. Excess soil erosion, dissolved solids or excess growth of micro-organisms can cause high turbidity on a long term basis. All of these can block light. Without light, plants die. Fewer plants mean less dissolved oxygen. Dead plants also increase the organic debris, which micro-organisms feed on. This will further reduce the dissolved oxygen. No dissolved oxygen means other aquatic life forms cannot live in the water. The water is stained dark brown from its sources in the bogs. The bottom can be seen as if through a brown stained glass window. I am unsure as to whether this means it has high turbidity. Will have to wait until the test to see the answer to that one. In general, the steeper the slope, the higher the velocity. But there are other factors involved in the exact velocity of a particular place. Some parts of a river, for example on the outside of a bend the velocity is likely to be faster, while on the inside slower than the average. In mountain streams, large boulders can create currents and eddies that may either speed up or slow down the speed of the water. I would expect from the general rule, the velocity would decrease down stream, getting slower as you proceed from site 1 to site 4. But it would also seem likely that site 2 would have a higher velocity that the others. However, given that the river was divided and very rocky on site 2, the velocity here could not be measured. 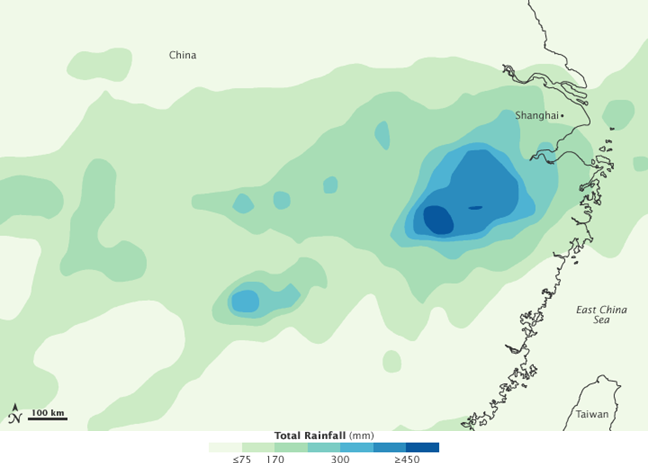 The width, depth and cross-section all change according the rainfall that has occurred in the recent past. All of these will increase if recent heavy rainfall has occurred. In general as more water is added to a river from tributaries you would expect it to get wider and deeper. However, in some places a river might become much wider but shallower, if the river banks were gentle. Also if it passed through a narrow gap, the river might become much deeper but narrower. So it is the cross-section that has some consistency, and that should increase as the river passes down stream. Is the amount of water passing a particular point in cumecs (cubic metres per second) and can be found by multiplying the velocity in metres by second by the cross-sectional area in square metres. As more water is added, then in general, you would expect the discharge to increase down stream. The weather was mild ( 13.5 to 15,5 deg C) and there was no wind to speak of. It was quite sunny at the start but had clouded over by 4.30 when we had fnsihed, but the cloud was light grey with no sign of rain. The Pressure was 1018 and rising . Tomorrow, Iw ill explain what we expected to find and why. But only did width, depth and velocity on sites 1, 3 and 4. Can you think why that was?